Queensland’s Sunshine Coast is normally known for its beautiful long, golden beaches bathed in sunlight and hugging a shoreline that the blue waters of the Pacific Ocean caress. Normally perfect for caravanners looking for coastal adventures and offering countless ideal locations at which to check out a new caravan. But on the very day Caravan World chose to take up the only opportunity to check out the first of a new brand of caravans called Marvel, the day refused to offer a sunny smile, instead it whimpered under a grey blanket of clouds. And it stole our opportunity to give the van a thorough whirl through the nearby Glass House Mountains. Instead, we headed to Pelican Waters, just south of Caloundra in Queensland's Sunshine Coast. A tailor made residential suburb, it wasn't the typical review location but gave some space to have a good look at the Golden Child. Here’s what we found. The new Marvel brand comes from the founders of Sunseeker Caravans. The word is that the Marvel name is designed to conjure ideas of something that is splendid, cool or groovy. Moreover, it’s meant to appeal to folk who want a quality van but can’t quite hit the price tag of its caravanning cousin Sunseeker. With that brief in mind, we took a look at the new Marvel Golden Child. 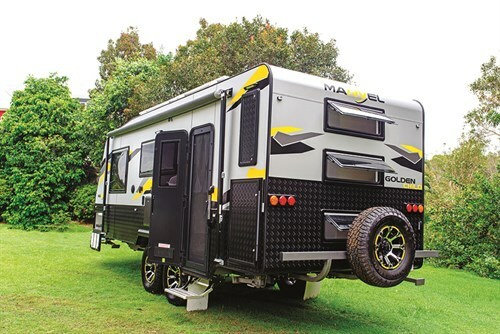 This first iteration of the Golden Child is a family van built for families keen to get off the beaten track from time to time. If first impressions count for anything, this van had the right look. A young and funky livery that suggests this van is keen for adventure. 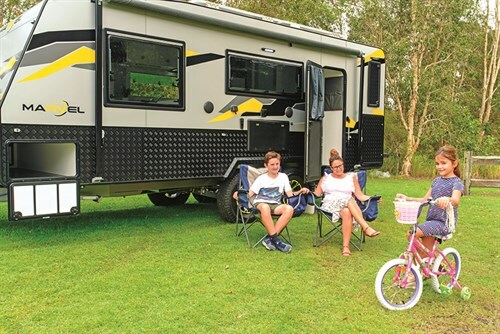 The sturdy chassis and suitable suspension together with the aluminium composite cladding, single-piece fibreglass roof and ample checkerplate protection all support its claim to belonging to the offroad caravanning fraternity. Adding to its offroad cred are a good selection of chunky tyres and wheels and plenty of gas with twin 9kg gas cylinders as well as solar panels to help keep the van off-grid for a few days. Some of the small details like checkerplate protection for the drawbar tap also boost its offroad cred. A sturdy rear bumper is well made and more than capable of carrying the weight of bike racks and bikes for the kids. On the downside, it’s offroad qualifications arguably take a slight hit thanks to the lack of a stoneguard on the drawbar. However, the point is mute given that there’s little on the drawbar to protect and no front window that a stoneguard might help protect. Of course, the cladding includes oodles of the previously noted checkerplate. Nonetheless, the gas regulator is exposed and vulnerable to taking a hit from an errant rock while motoring along some rough road somewhere. More importantly, the Meranti framework, for my money, is more suited to the blacktop tourer than an offroad caravan. Offroad travel inevitably shakes and rattles caravans much more than black-top touring and potentially offers dust and water greater opportunity to seep beyond the cladding. While dust is a nuisance, timber is subject to water rot if you don’t take care to ensure joins are properly sealed over the life of the van. Mitigating that is the fact, the Marvel build seems sturdy with a high-quality finish that comes with a quality build – and that’s a sound start to adventure. 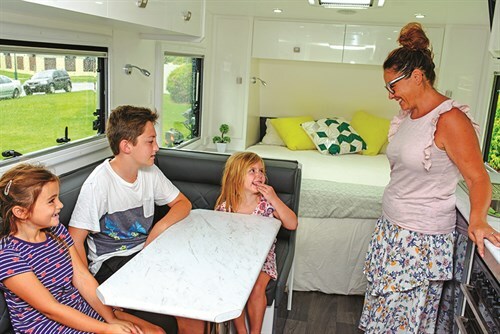 It’s plain that the Marvel Golden Child is geared for family travel, three bunk beds, a huge leather dinette, large windows and ample usb ports for all of those pesky electronic devices. Just a quick note on the beds, from the master bed to the bunk beds, ventilation and light in this van is so well catered. The bunks have rear windows meaning there’s no stuffy, claustrophobic feel to sleeping in the rear of the van. And despite the lack of a front window the master bed is well lit and ventilated thanks to a roof hatch and large side windows that provide heaps of light, great ventilation and open up the van to make the most of your holiday view. In any event, the van provides air-conditioned comfort. The family friendly features don’t stop there. A flat screen TV and large fridge are the sort of amicable pairing that anyone with young kids would well appreciate. What’s more, when it comes to comfort the size of the dinette is beyond generous. There’s ample elbow room to keep even the most rambunctious tweens or toddlers from complaining that so-and-so is taking up too much room. There’s also plenty of room for a good board game when it’s raining outside. On the downside, there is the lack of a privacy screen between the kids’ bunks and the rest of the van. That might not seem like a big deal, but when you’re on a lengthy tour, a little privacy might go a long way. The outside storage is more limited however and includes a tunnel boat and a rear storage cabinet only. Feeding the hordes is not a chore in the Marvel given it comes equipped with a large Thetford two-door, three-way evaporative fridge-freezer. Not only does this mean plenty of room in the fridge, it means that the fridge automatically searches for available fuel or power. Consequently, you’re never going to find the ice-cream defrosted or the steaks gone prematurely off because your battery went flat, the 240V-power failed or you ran out of gas. 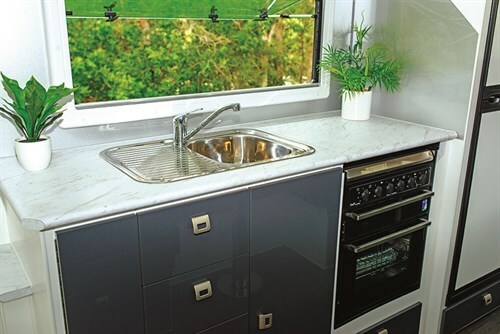 The gourmet chef in the family will be happy with the Swift stove that includes an electric burner and three gas burners together with a full oven, so cooking the baked beans and heating up the family-sized meat pie is no trouble at all. The kitchen, as elsewhere on the inside and the outside, has plenty of storage. Throughout the interior, overhead lockers, a pull-out pantry, well-made drawers and under-bed storage mean you’re not scratching around searching for somewhere to keep this or that. Even the kids have plenty of drawers and hanging storage. When it comes to power out in the bush, the Golden Child’s electricity combo is reasonable with two, 150W monocrystalline solar panels with 30A solar regulator and twin 100Ah deep-cycle batteries. In a world that’s increasingly moving towards Lithium batteries that hit the hip pocket like a Jeff Horn right hook, the more respectable standard deep-cycle batteries are a more family friendly selection for the rig. Talking about family friendly, every good family van needs a quality en-suite. The en-suite in this van has the right sort of gear that works well and is a suitable quality without setting the budget into orbit. Perhaps the major downside of van is the size of the en-suite. This one is on the small side. If you’re idea of a family van is one of absolute luxury then don’t look at |this van. 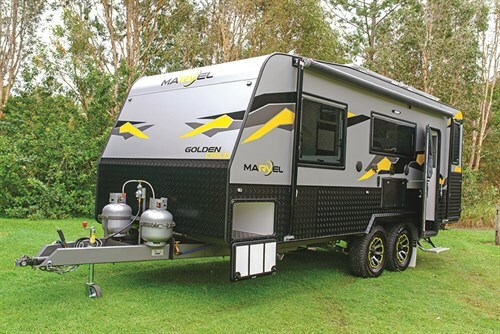 If a practical and, at a smidge under $65,000, affordable rig that will keep the kids, the missus and you happy, then this Marvel offering is well worth considering. To enquire about this caravan, please visit http www.sunseekercaravans.com.au or phone (07) 5491 1888.